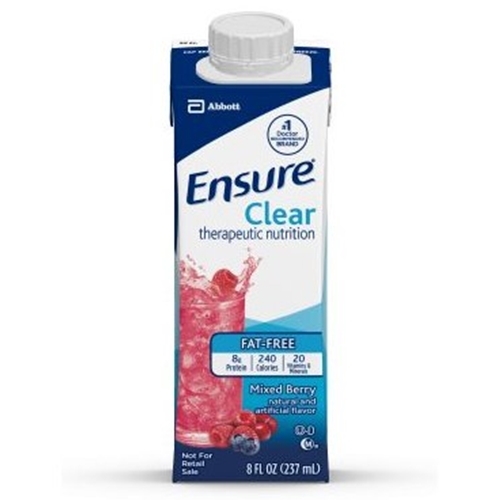 Ensure Clear Therapeutic Nutrition Drink from HealthyKin.com is a great-tasting, clear liquid nutrition drink that contains high-quality protein and essential nutrients. It is fat-free, making it an ideal choice for patients on clear-liquid, pre- and post-surgical, bowel prep, fat-malabsorptive, and fat-restricted diets. It is also ideal for patients who prefer a fruit-flavored alternative to creamy shake-like supplements. 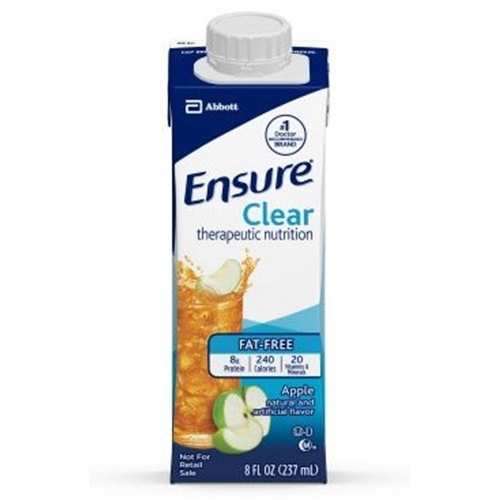 Ensure Clear can benefit patients who have malnutrition, are at nutritional risk, or are experiencing involuntary weight loss. Father was given apple ensure while recovering in hospital. He was able to tolerate the clear when the regular ensure was too thick for him to swallow. My mom has esophageal cancer, and it is the only thing she will drink. They actually very tasty! Great drink with a lot of protein. My husband is recovering from back surgery, and is not eating well, so he was introduced to apple in the hospital and it is full of good stuff that he is not getting because he's not eating well. Delivered quickly. Love the flavor. Some days it is the only thing I can drink. Just wish stores still carried the clear products. I had to start dunking this due to health issues. I could not drink the other stuff. I really like it. Had a great taste. My son has to drink n said tbe flavor is tolerable. My 93yr old mother and I both drink Ensure Clear. It's a great source of protein, minerals and vitamins. Best of all, it tastes great!!! !